Is Iraq Headed for a Crackup? What no reporter seems to have tumbled to is that Newt is dumb as an old boot. John Boyd and I had several years of "working" with him in the Congressional Military Reform Caucus, years during which Newt found it advantageous to pose as a reformer. Within a month or so, John and I both realized that Newt had almost perfect recall of other people's intellectual-sounding ideas and phrases--and could barf them back convincingly without understanding a shred of the content. At the drop of a hat he could string together a two hour lecture on anything from concocting new war-winning technologies to optimizing grand America's strategy the 21st century. For the listening layman, the entire two hours would flow seamlessly and every idea would sound newly minted and carefully crafted. But for those of us who knew the sources of Newt's cribs, it was perfectly obvious that not one of those ideas was his, nor did he have the shallowest comprehension of any of them. You can imagine what an intellectual giant that major general was who found Newt's Flag Officer War Fighting Course lectures so mesmerizing. John Boyd and I also met with Newt a few times in the early 80s, when I worked in the Pentagon. To give a little background: At that time, I was a member of a small group of Pentagon insiders who became known as the "military reformers." Boyd, a retired Air Force colonel, legendary fighter pilot, a noted airplane designer and tactician, was the spiritual leader of our merry crew. Boyd was also one of America's leading strategists and theoreticians on the art of war. Boyd and Sprey were the intellectual leaders of the movement. I was happy enough to be a foot soldier in the effort. A short bio of Boyd can be found here; and Robert Coram's very popular book-length biography of Boyd and the inner workings of the reformers can be found here (it is still in print after 11 years and sales are now approaching 100,000). A compendium of Boyd's famous briefings on the the nature of conflict together with the associated theory of the Observation - Orientation - Decision - Action (OODA) Loop, "A Discourse on Winning and Losing," can be downloaded here. Newt's propensity for bombastic lecturing on subjects he knew little about was immediately obvious to us all. In fact, I was so impressed by Newt's utterings I nicknamed him Neutrino after a small, almost massless, sub-atomic particle in physics. Like Newt, neutrinos are made possible by decadence -- intellectual in the case of Newt, radioactive in the case of physics; like Newt, neutrinos flit about uncontrollably at very high speeds, while producing even more chaotic reactions that fold back on themselves -- self-destructively in the case of the Newt, or as anti-particles in the case of the physics. So, like Newt, neutrinos are very hard to make sense out of. Of course no analogy is perfect -- neutrinos have no electric charge, whereas it is very clear Newt is highly, if erratically, charged. Quite unlike Newt, Pierre has substantive defense bona fides: fluent in German and French, as well as English; he is a widely-read polymath with degrees in mechanical engineering, french literature, and mathematical statistics. Pierre's track record has established him as a brilliant engineer and mathematician and he has been a path-breaking pioneer in analyzing the lessons of combat and how to apply them to the design of weapons. Along with Colonels Boyd and Everest Riccioni, for example, Pierre was one of the central intellectual forces evolving the design of the F-16, perhaps the most successful US fighter since the Korean War F-86. Pierre was also the chief intellectual inspiration behind the design of the brilliantly successful and highly-feared A-10 close air support aircraft. He has written widely on military reform as well as design, testing, and weapons acquisition issues, most recently contributing the insightful Essay 9, "Evaluating Weapons: Sorting the Good from the Bad," to the The Pentagon Labyrinth: 10 Short Essays to Help You Through It, an anthology written by nine defense insiders with over 500 years of cumulative experience. (Truth in advertising: I am author of Essay 1). Witty as it is, Pierre's evisceration of Neutrino goes beyond mere entertainment; it is important because it brings into sharp focus a truly scary aspect of the emerging presidential election, not to mention American politics in general -- namely, the dangerous addiction to mindless warmongering that now pervades the defense debate in America, be it explicit in the case of the Republican presidential candidates (Ron Paul excepted) or implicit in the reckless triangulations of a weak, cynical president (discussed in my last posting). Neutrino is one of the America's leading warmongers -- and like most of his brethren, he has never served a day in uniform. Nor has he slugged it out in the trench warfare of fixing Military - Industrial - Congressional Complex, although he slopped in the gravy of its cash flows. Yet as Tumulty pointed out, he is lecturing our generals how to fight wars. The fact that US generals invite a mental disarmament specialist like Newt to lecture them on the arts of strategy and warfighting and are then are mesmerized by his lectures says more about the intellectual and professional state of our military leadership as it does about the Neutrino. It goes a long way to explain (a) why our military interventions since WWII are devolving into one of history's longest strings of "incomplete successes" (to borrow Jimmy Carter's immortal reference to the disastrous Iranian hostage rescue mission made at a 29 April 1980 press conference), and (b) why the old reformers went on record for one last time by producing The Pentagon Labyrinth in 2011 and make it available, together with a huge a amount of source information, free of cost on the internet at this link. Boyd's works has been written about widely since the late 1970s and has had enormous influence in many fields. If you doubt this, just google "OODA Loop"
 I used the descriptor polymath advisedly; Pierre is also the founder and chief engineer of Mapleshade Studios, considered by many audiophiles to be one of the finest and most innovative producers of sound, especially jazz. James Madison's letter to W.T. Barry (4 August 1822). President Obama -- perhaps inadvertently -- is playing the same game with regard to Iran by trying to neutralize his political opposition at home with a dangerous mutation of Bill Clinton's cynical triangulation strategy. In this case, the goal of the triangulation strategy is to pull the rug out from under the Republican warmongers like Mitt Romney and Newt Gingrich. If he can co-opt the domestic political pressures for war against Iran, Mr. Obama may well think he can better position himself for the upcoming presidential election. But in so doing, he would be running a real risk of starting yet another ill-conceived war, whether he wants to or not. (Patrick Seale explains one way the march to war could spin out of Obama's control at this link.) To make matters worse, Mr. Obama is a man who has demonstrated that he talks a good line but fails to deliver on his promises when under pressure -- just ask the Arabs about his Cairo speech or progressives who believed his promises about health care reform and "change your can believe in." Whether or not triangulating questions of war and peace is a question of Obama's free will is quite beside the point: a malleable man is playing with the most dangerous kind of fire. My last post, Beating the War Drums in Versailles on the Potomac, described the buildup of domestic political pressures to launch an attack on Iran in the name of prempting Iran's acquisition of nuclear weapons, notwithstanding the fact that there is no solid intelligence proving the Iranians have embarked on a program to acquire those weapons. This aim of this post is to alert interested readers to another analysis in the same vein, but analyzed from a different angle. In The Winners and Losers of US policy on Iran, an op-ed that appeared in Al Jazeera (English) on 23 December, Jasmine Ramsey provides a useful insight in to the warmongering pressures on a president prone to appeasing his opposition for domestic political reasons. The new year is shaping up to be a very dangerous one, because appeasing an external aggressor, like Adolf Hitler, is not the only kind of appeasement strategy that leads to war. Any president who feels it is necessary to brag about being "The Decider" is insecure by self-definition. On 12 December, I described a concatenation of warmongering pressures that were shaping the popular psyche in favor of bombing Iran. Now, in a 21 December essay [also attached below], Steven Walt describes a further escalation of these pressures -- in this case, via the profoundly flawed pro-bombing analysis, Time to Attack Iran: Why a Strike is the Least Bad Option, penned by Matthew Kroenig in January/February 2012 issue of the influentual journal Foreign Affairs. One would think that our recent experiences in Iraq and Afghanistan and our growing strategic problems in Pakistan, not to mention our economic problems and political paralysis at home, would temper our enthusiasm for launching yet another so-called preventative war. But that is not the case, as Kroenig's analysis and the growing anti-Iran hysteria in the debates among the the Republican running for president show (Ron Paul excepted) show. Moreover, President Obama’s Clintonesque efforts to triangulate the pro-war political pressures of the Republicans, while appeasing the Israelis, may be smart domestic politics in the short term, but they add fuel to the pro-war fires shaping the popular psyche. Finally, as I wrote last January, lurking beneath the fiery anti-Iran rhetoric are more deeply rooted domestic political-economic reasons for promoting perpetual war -- reasons that have more to do with sustaining the money flowing into the Military - Industrial - Congressional Complex in the post-Cold War era than in shaping a foreign policy based on national interests. While it is easy to whip up popular enthusiasm for launching a new war, our misadventures in Iraq and Afghanistan have shown that successfully prosecuting wars of choice are quite another matter. Nevertheless, as my good friend Mike Lofgren explains in his recent essay, Propagandizing for Perpetual War, devastating rebuttals like Walt's are likely to have little effect on the course of events. One final point ... a surprise attack on Iran would trigger a far tougher war to prosecute successfully that either Iraq or Afghanistan. If you doubt this, I suggest you study Anthony Cordesman’s 2009 analysis of the operational problems confronting Israel, should it decide to launch a surprise attack on Iran’s nuclear facilities. Yet, the beat goes on. If you'd like to read a textbook example of war-mongering disguised as "analysis," I recommend Matthew Kroenig's forthcoming article in Foreign Affairs, titled "Time to Attack Iran: Why a Strike Is the Least Bad Option." It is a remarkably poor piece of advocacy, all the more surprising because Kroenig is a smart scholar who has done some good work in the past. It makes one wonder if there's something peculiar in the D.C. water supply. Kroenig's piece follows this blueprint perfectly. He assumes that Iran is hellbent on getting nuclear weapons (not just a latent capability to produce one quickly if needed) and suggests that it is likely to cross the threshold soon. Never mind that Iran has had a nuclear program for decades and still has no weapon, and that both the 2007 and 2011 National Intelligence Estimates have concluded that there is no conclusive evidence that Iran is pursuing an actual bomb. He further assumes -- without a shred of evidence -- that a nuclear-armed Iran would have far-reaching geopolitical consequences. For example, he says that other states are already "shifting their allegiances to Tehran" but doesn't offer a single example or explain how these alleged shifts have anything to do with Iran's nuclear program. Kroenig also declares that a nuclear-armed Iran would force the United States to "deploy naval and ground units and potentially nuclear weapons across the Middle East, keeping a large force in the area for decades to come." But why? Iran's entire defense budget is only about $10 billion per year (compared with the nearly $700 billion the United States spends on national defense), and it has no meaningful power-projection capabilities. Thus, contrary to what Kroenig thinks, containing/deterring Iran would not add much to U.S. defense burdens. The Persian Gulf is already an American lake (from a military point of view), and Washington already has thousands of nuclear weapons in its own arsenal. Given how weak Iran really is, containing or deterring them for the foreseeable future will be relatively easy. The key point is that Kroenig offers up these lurid forecasts in a completely uncritical way. He never asks the probing questions that any security scholar with a Ph.D. should axiomatically raise and examine in a sophisticated manner. Instead, his article is a classic illustration of worst-case analysis, intended to make not going to war seem more dangerous than peace. When he turns to the case for using force, however, Kroenig offers a consistently upbeat appraisal of how the war would go. (Needless to say, this is not the kind of analysis one would expect from a Georgetown professor.) He knows there are serious objections to his proposed course of action, and he works hard to come up with reasons why these concerns should be not be taken seriously. What if Iran has concealed some of its facilities? Such fears are overblown, he thinks, because our intelligence is really, really good. (Gee, where have we heard that before?) What about facilities that are hardened or defended? Not an insurmountable obstacle, he maintains, and in any case there are plenty of other facilities that are aboveground and vulnerable. Isn't there a danger of civilian casualties? Well, yes, but "Washington should be able to limit civilian casualties in any campaign." What if Iran escalates by firing missiles at U.S. allies, ordering its proxies to attack Israel, or closing the Strait of Hormuz to oil shipments? Not to worry, says Kroenig, "None of these outcomes is predetermined," and the United States "could do much to mitigate them." (Of course, none of the scary outcomes that Kroenig says would accompany an Iranian bomb are "predetermined" either.) Doesn't starting a war increase the risk of regional conflict, especially if Iran retaliates and Americans or Israelis die? Maybe, but not if the United States makes its own "redlines" clear in advance and if it takes prudent steps to "manage the confrontation." To do this we have to be willing to "absorb Iranian responses that [fall] short of these redlines" and reassure the mullahs that we aren't trying to overthrow them (!). Bombing another country is a peculiar way to "reassure" them, of course, and it's a bit odd to assume that those wicked Iranians will be cooperative and restrained as the bombs rain down. Won't Iran just reconstitute its nuclear program later, and possibly on a crash basis? It might, but Kroenig says that we would have bought time and that whacking the Iranians really hard right now might convince them to give up the whole idea. Or not. You see the pattern: When Kroenig is trying to justify the need for war, he depicts an Iran with far-reaching capabilities and dangerously evil intentions in order to convince readers that we have to stop them before it is too late. But when he turns to selling a preventive war, then suddenly Iran's capabilities are rather modest, its leaders are sensible, and the United States can easily deal with any countermeasures that Iran might take. In other words, Kroenig makes the case for war by assuming everything will go south if the United States does not attack and that everything will go swimmingly if it does. This is not fair-minded "analysis"; it is simply a brief for war designed to reach a predetermined conclusion. And let's be crystal clear about what Kroenig is advocating here. He is openly calling for preventive war against Iran, even though the United States has no authorization from the U.N. Security Council, it is not clear that Iran is actively developing nuclear weapons, and Iran has not attacked us or any of our allies -- ever. He is therefore openly calling for his country to violate international law. He is calmly advocating a course of action that will inevitably kill a significant number of people, including civilians, some of whom probably despise the clerical regime (and with good reason). And Kroenig is willing to have their deaths on his conscience on the basis of a series of unsupported assertions, almost all of them subject to serious doubt. Kroenig tries to allay this concern by saying that the main victims of a U.S. attack would be the "military personnel, engineers, scientists, and technicians" working at Iran's nuclear facilities. But even if we assume for the moment that this is true, would he consider Iran justified if it followed a similar course of action, to the limited extent that it could? Suppose a bright young analyst working for Iran's Revolutionary Guards read the latest issue of Foreign Affairs and concluded that there were well-connected people at American universities and in the Department of Defense who were actively planning and advocating war against Iran. Suppose he further concluded that if these plans are allowed to come to fruition, it would pose a grave danger to the Islamic Republic. Iran doesn't have a sophisticated air force or drones capable of attacking the United States, so this bright young analyst recommends that the Revolutionary Guards organize a covert-action team to attack the people who were planning and advocating this war, and to do whatever else they could to sabotage the forces that the United States might use to conduct such an attack. He advises his superiors that appropriate measures be taken to minimize the loss of innocent life and that the attack should focus only on the "military and civilian personnel" who were working directly on planning or advocating war with Iran. From Iran's perspective, this response would be a "preventive strike" designed to forestall an attack from the United States. Does Kroenig think a purely preventive measure of this kind on Iran's part would be acceptable behavior? And if he doesn't, then why does he think it's perfectly OK for us to do far more? My close friend Mike Lofgren writes an important essay describing the nature of 'truth' in the Orwellian echo chamber that is closing the American mind in the 21st Century. "As difficult as [the Iraq war] was, I think the price has been worth it, to establish a stable government in a very important region of the world." One’s only reaction to this statement is to blink in disbelief and wonder: is Panetta that stupid, or does he think that we, the supposedly self-governing citizens of this country, are that stupid? The kindest thing one can conclude is that this is some sort of throw-away line intended to provide solace to the families of those killed, or consolation to survivors who were maimed. But that is pretty thin gruel; one imagines those people, and their kin, have formed their own opinions about what happened and do not require a patronizing justification. And, in any case, if it was “worth it,” why shouldn’t we keep doing it, not only in Iraq but all over the world? Perpetual war for stable government, one might call it. Another explanation that comes to mind is the propaganda aspect of it: some government hacks really do believe if they repeat something over and over, no matter threadbare or false, a large number of people will believe it. Republicans have used this technique for years, and it appears Democrats are well on their way to equaling them in mastering it. It seems to be at least a partially successful tactic: after all the bloodshed and the waste, a plurality of 48 percent of Americans still believes invading Iraq was the right decision, according to a Pew Research survey. But, as Honest Abe said, you cannot fool all of the people all of the time. That same survey showed 46 percent, almost as many, believed it was the wrong decision. But even here, Panetta’s statement, and countless other ridiculous statements by government officials, are not without their utility. Most of us think of propaganda as brainwashing – as convincing people to believe something they would otherwise disbelieve. But we may underrate another, more subtle, utility of political propaganda. In one of his wartime essays, George Orwell remarked on some of the patently ridiculous claims of totalitarian propaganda. In his view, the point wasn’t whether it was believable or not; in fact, the more ridiculous the better. The point was that government functionaries got to make the statement knowing full well it was ludicrous; news organizations dutifully printed it as if it were fact; and the public sphere was blanketed with the absurd propagandistic claim. As Orwell said about the goosestep march of totalitarian armies: yes, it looks ridiculous, but you dare not laugh. That is the underrated objective of false government claims: even when they do not convince, they demoralize. Panetta’s statement will receive respectful coverage in the mainstream media; satraps of the establishment like David Gregory or Bob Schieffer will not argue with him on the Sunday morning talk shows beyond at most a very polite demurral; for all intents and purposes he will get away with it. And no ordinary citizen will ever be in a position to get in his face and tell him he’s shilling for destructive policies that are bankrupting us. Because that’s how democracy, and truth, work in the United States these days. Will Germany Kill the Goose that Laid the Golden Egg? Since the middle of the 19th Century, the central questions in European politics have been been have been the closely connected questions of nationalism and the rise of German power. As my good friend and eminent historian Gabriel Kolko shows in the brilliant essay attached below, the post war solutions of NATO and the European Union, together with the exigencies of the Cold War, put these questions on hold, but their fundamentals remained, sleeping beneath the surface, and today, the conflicting questions of nationalism and German power are again coming to the fore to create ominous problems for Europe and the world. There can be no question that, until 2007 or so, the European Union -- particularly the opening of borders, the free flow of labour and capital, the disappearance of tariffs, and diminution of non-tariff trade restrictions, etc. combined to make life better for the mass of average Europeans. Standards of living rose steeply and social services improved in parallel. This was particularly evident in the poorer EU countries on the southern rim. I saw and experienced this astounding improvement in the quality of life on a very personal level, living on a sailboat in southern Europe since the summer of 2005. I will never forget the comment made to me by an Italian psychologist in Calabria in 2006, which is the heart of the provincial south of Italy, "It is a great time to be a European." To be sure, he was an educated member of the upper middle class, and not representative of the average Calabrian, but it struck me that this Calabrian saw himself as a European. It was not very long ago, that such a person would only loosely consider himself to be an Italian, not to mention a European. But the EU also benefitted the richer countries of northern Europe, especially Germany, which became the world's largest export economy, in part due to the industriousness of the German people, but also in part because of the advantages bequeathed to Germany by the world's largest duty free zone. German banks, among those of other countries, also benefitted enormously from the debt-driven, global hyper-capitalism. That achievements in Germany, as well as Europe, are now at risk, in part because the contradictions implicit in the rise of neoliberal economics created the worldwide debt crisis and are now distorting the response to that crisis, but also because of hubris in the European project itself. As Kolko shows below, it is becoming clear that, within this context, Germany is again evolving a hegemonic policy that, in effect, is struggling to 'have its cake and eat it too.' The most outward manifestations of this evolution can be seen in the effort to save the Euro by attempting to intensify the EU's integration by increasing reliance on a kind of German neo-Calvinist economics. One irony in the integration crisis not mentioned by Kolko is that the proximate cause of the political rigidity aggravating the debt crisis -- the Euro -- was adopted just when advances in electronic banking were drastically reducing, if not eliminating, the practical advantages of a common currency, yet the adaption of the common currency placed member governments in fiscal straight jackets. Had the Euro not been adopted, and everything else remained the same, Spain could have devalued the Peso, Italy the Lira, etc, but then those devaluations would have increased value of the Mark and created discomfort in Germany -- which brings us back to Kolko's analysis. There are extremely important differences between this decade and the period after the First World War and through the early 1930s. Ms. Merkel is more than likely to fail in her ambitious plans. The long view of history is likely to record the greatest 'sins' of Iraq, Iran, and Libya prompting interventions by the West have been related to the control of oil -- not nuclear weapons; not any communist leanings during the Cold War; not support of worldwide terrorism. Iran - Mohammed Mosaddegh, a popularly elected Prime Minister of Iran, and a modernizer and social reformer, removed by a CIA/MI6 coup in August 1953. Iraq - Saddam Hussein, a murderous neo-Stalinist dictator, but also a modernizer and social reformer (e.g., major achievements in women's rights and education), removed by military force in 2003. Libya - Muammar Qaddafy, a quirky tribal dictator, but also a moderniziner and social reformer (e.g., major achievements in women's rights and education) removed by military force in 2011. One short-term common denominator in these imposed regime changes was that, regardless of how the regime change was justified or rationalized, the nationalist leader was replaced by a more compliant government that agreed to an opening of that country's oil fields to exploitation by privately owned western oil companies. While history does not repeat itself, memories of the past do condition events in the future. Over the longer term, perceived wrongs are not forgotten, and such interventions can provoke blowbacks, which in turn provoke counteractions that further enmesh the intervening party in a growing welter of increasingly complicated conflicts. In the case of Iran, for example, the 1953 coup eventually backfired in 1979, when Reza Shah Pahlavi was overthrown by the Islamic revolution led by the Ayatollah Khomeini. Khomeini then established a regime retook control of Iran's oil fields, among other things. But the Iranian game is not over, and the historical pattern of move and countermove is in play, with the nationalist (Islamic) regime of Iran again in the West's crosshairs, allegedly because of its nuclear ambitions and support of international terror. Nevertheless, the glittering temptations of re-privatizing Persian oilfields are lurking in the background, attracting the private oil interests of the West like flies to honey. It is too early to tell if or how blowback will unfold in Libya or Iraq, and the histories, cultures, and the unfolding conditions in these countries are very different from those in Iran. The privatization of Libya's oil fields is just beginning. On the other hand, as Cockburn points out, a process of divide-and-conquer privatization is well underway in Iraq; and it is already creating potentially explosive ramifications. Furthermore, in Iraq, the potential for a regional blowback from the privatization of Iraq's oilfields is complicated by the unique detritus left over from the destruction of the Ottoman Empire, including the hypocritical colonialist assumptions implicit in 1919 Versailles Treaty, the empty promises of Woodrow Wilson's 14 Points, and the nationalist assumptions implicit in the 1923 Treaty of Lausanne (see summary & text) which established the boundaries for the modern Turkish nation -- which in fact were a fait accompli imposed on the Allies by the stunning military accomplishments of Kemal Ataturk. 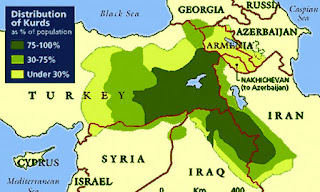 In so doing, Ataturk (1) nullified the cynical Anatolian partition plan envisioned by the Allies in their stillborn 1920 Treaty of Sèvres and (2) forced the British to renege on their promise to give the Kurds an independent nation in what is now southeastern Turkey (but significantly the British did not include the oil rich Kurdish regions in Iraq in their promise of Kurdish nationhood), among other things. Thus the Exxon maneuver has the potential for inflaming the still unresolved Kurdish Question is all sorts of ways. The the map hints at this complexity by telling use Kurds live, and interested readers will find a short but excellent historical summary of the Kurdish question here. There are 20 million or so Kurds, and they are probably the world's largest ethnic group without their own nation. While they are a tribal based society, and are by no means unified, their nationalist aspirations and minority rights have been ignored -- sometime brutally -- since the Treaty of Lausannne nullified the question of Kurdish statehood. This has been true especially for the areas now encompassed by eastern Turkey and northern Iraq, but oppression has also occurred in Syria and Iran. The 2003 invasion of Iraq reinvigorated the Kurds' separatist ambitions once again. But this time, the ambitions are being fueled by the oil wealth described below by Cockburn. The emergence of an economically viable Kurdish nationalism changes the separatist game fundamentally. Moreover, the increased the restiveness of the outlawed Kurdish Workers Party (PKK) in Turkey despite Turkeys recent efforts to accommodate itself Kurdish demands, threatens to spill over to destabilize and provoke violent reactions in Turkey as well as Iraq (see here for a recent example of this dynamic in action) -- and perhaps even Iran and Syria. Interested readers can go here for a contemporary Turkish point view or here for a contemporary Kurdish point view on the separatist question. If there is one thing the Wars of the Yugoslavian Succession ought to have taught the sclerotic elites shaping US foreign policy in the post-cold war era, it is that breaking up an ethnically diverse country previously held together by an iron hand does not necessarily improve protections of minority rights. Just ask the Serbs in Northern Kosovo who have roots roots in the region reaching back a thousand years whether or not Kosovo's independence has improved their lot in life. My guess for the future of Iraq and its immediate environs: Add oil to this volatile Kurdish Question, and we ain't seen nuttin yet. And that, dear reader, is why, if you have not already done so, you ought to read Cockburn's report. The bombshell exploded last month when Exxon Mobil, the world's largest oil company, defied the instructions of the Baghdad government and signed a deal with the Iraqi Kurds to search for oil in the northern area of Iraq they control. To make matters worse, three of the areas Exxon has signed up to explore are on territory the two authorities dispute. The government must now decide if it will retaliate by kicking Exxon out of a giant oilfield it is developing in the south of Iraq. Political leaders in Baghdad say the company is putting the unity of their country at risk. Hussain Shahristani, the Deputy Prime Minister in charge of energy matters, told The Independent in an interview in Baghdad that any oil or gas field development contract in Iraq "needs the approval of the federal government, and any contract that has not been presented to the federal government has no standing and the companies are not advised to work on Iraqi territory in breach of Iraqi laws". Baghdad has had oil disputes before with the Kurdistan Regional Government (KRG), but the present row is far more serious because it is the first time "Big Oil" has moved into Kurdistan, showing that at least one of the major oil companies is prepared to disregard threats from the government of Nouri al-Maliki. Previously, only small independent foreign oil companies, without other interests to protect in the rest of the country, have risked signing contracts with the Kurds. "Exxon Mobil was aware of the position of the Iraqi government," says Mr Shahristani, a former nuclear scientist who was tortured and imprisoned by Saddam Hussein. "We hear from the American government that they've advised all American companies, including Exxon Mobil, that contracts should not be signed without the approval of the federal government." Whatever the prospects of finding oil in the north of Iraq, observers are surprised that Exxon is prepared to hang its future in Iraq on the outcome of the power struggle between Iraqi Kurdistan and the central government. Control of the right to explore for oil and exploit it is crucial to the authorities on both sides since they have virtually no other source of revenue. The Kurds have won a degree of autonomy close to independence since the fall of Saddam, and the ability to sign oil contracts without reference to Baghdad will be another step towards practical independence and the break-up of Iraq. A parallel would be if the Scottish government were to sign exploration contracts in the North Sea without consulting London. What makes the Exxon-KRG deal particularly inflammatory, says Mr Shahristani, is that three of the six blocs where Exxon is planning to drill are understood to be "across the blue line – that is outside the border of the KRG". This means they are in the large areas in northern Iraq disputed between Arabs and Kurds since 2003, but where the Kurds have military control. The government must now decide if it will make good on its threats and replace Exxon at a mammoth oil field called West Qurna 1 at the other end of the country, north of Basra. Iraqi oil officials hint that Royal Dutch Shell might replace the American company. Both sides have much at stake. The Iraqi government is totally reliant on its oil revenues to pay its soldiers, police force and civilian officials. It needs vast sums to rebuild the country after 30 years of war, civil war and sanctions. In 2009, it began to expand its oil industry by signing contracts with firms such as BP, Royal Dutch Shell and Exxon to boost production in under-exploited and poorly maintained fields. These companies thereby gained access to some of the largest fields in the world, each with reserves of more than five billion barrels. Vast sums are being invested, mostly around Basra in the south of Iraq. Oil output, now at 2.9 million barrels a day, is due to rise to a production capacity of 12 million b/d by 2017, potentially putting Iraq on a par with Saudi Arabia as an oil exporter. Mr Shahristani is pleased with progress so far, saying that what "we are doing in Basra is at least five times larger than the largest oil projects in the history of the oil industry so far." Sitting in his vast office in a cavernous palace originally designed for one of Saddam's senior lieutenants, he holds up a chart showing the surging production from the Rumaila oilfield of 1.4 million b/d, more than Britain's entire current output of crude from the North Sea. Iraqis are split on whether Exxon is being cunning or naive. One explanation is that the oil company feels so powerful, or so essential to Iraqi oil development, that it can disregard the Iraqi government. An alternative argument is that Exxon is dissatisfied with the West Qurna 1 deal and so does not mind walking away from it and looking for oil elsewhere. A third is that the company got suckered by the Kurds. Iraqi Arabs know that the Iraqi Kurds want to control as much of Iraq's oil reserves as possible to buttress their independence. Less easy to understand is why Exxon should willingly make its activities a central issue in the Arab-Kurdish confrontation which has for so long destabilised Iraq. The transfer of Iraq's military bases [as US leaves] to local control is another flashpoint between the Kurdistan Regional Government and Baghdad, and some fear the dispute may boil over when US forces pull out at the end of the year. Last month saw a tense standoff between the Iraqi army and local Kurdish forces at a US airbase in the northern city of Kirkuk, an oil-rich area long a point of dispute. The Kurdish police force reportedly blocked an army team from entering the base for an official handover from the US, unhappy that it was being transferred to Baghdad. In an effort to calm the drama, the US ambassador, James Jeffrey, met Kirkuk's Governor, Najmaldin Karim, and Iraq's Prime Minister, Nouri al-Maliki, in the capital. "We did not want a situation where we ended up shooting at each other," said Mr Karim. The situation was defused when the central government made assurances that the base would be used for civilian aircraft only, a key demand of the Kurds. However, once the base is handed over to Iraqi control, Washington will have little control over whether Baghdad sticks by its verbal agreement. Indeed, Ali Ghaidan, the commander of Iraq's ground forces who led the army team that eventually entered the base, has since publicly ruled out the possibility of the base being turned into a civilian airport – saying it is of too much strategic importance to Iraqi forces. Reports of Kurdish security forces, known as peshmerga, bolstering their presence in Kirkuk have raised questions over how long the lid can be kept on this simmering conflict.